On January 11, 2012, Hilton released a free song called "Loaded Gun" from his upcoming album Forget the Storm on his website and was featured in the season 9 premiere episode of One Tree Hill following his return as Chris Keller. Hilton also debuted two songs from the album called "Kicking My Heels" and "Prince of Nothing Charming" on the show. On February 14, 2012, "Prince of Nothing Charming", the first single from Hilton's upcoming album Forget the Storm, was made available on iTunes. On March 7, 2012, Hilton revealed via Twitter that Forget The Storm, his first full-length LP since 2004, would be released on April 3, 2012. The album was produced by David Hodges among others and released through Hilton's own label, Hooptie Tune Records. He chose to title it "Forget the Storm" as a reference to his unreleased album, "The Storms We Share," and described it as "a little more rock and roll." Hilton began a tour in the United States with Dion Roy and "Dakota and Will" in March 2012 which ended mid June 2012. He also toured with Boyce Avenue in the UK and Ireland in June 2012 until July 2012 and will return late October 2012 on his own headlining tour after more US shows, wrapping up the year with shows back in the US. On December 7, 2016 Hilton release a new single called "Next To You" on iTunes; It was recorded on his Forget The Storm Deluxe Version as an acoustic version. In 2007, Hilton played the love interest in country music artist Taylor Swift's music video for her song "Teardrops on My Guitar" and appeared in the 2008 film Charlie Bartlett. He was with Charlie Bartlett co-star and now wife Megan Park in the music video for the band Gloriana's song "(Kissed You) Good Night" released in January 2012. ^ "TYLER HILTON SHY GIRL Lyrics changes from version 1 to 2". Mp3lyrics.org. Retrieved 2012-07-31. ^ "Tyler Hilton - Hilton Finds Love With Movie Co-Star". contactmusic.com. February 11, 2008. Retrieved May 3, 2012. ^ Garcia, Jennifer (January 23, 2014). "Tyler Hilton Engaged to Megan Park". People. Time Inc. Retrieved October 19, 2015. ^ "Tyler Hilton and Megan Park Engaged, Planning Spring 2015 Wedding". Us Weekly. January 23, 2014. ^ Vulpo, Mike (October 10, 2015). "Tyler Hilton and Megan Park Are Married! All the Details on the Couple's Fall-Themed Celebration". E! Online. Retrieved October 19, 2015. ^ Brandee J. Tecson (March 16, 2005). "Tyler Hilton Took Elvis Role So He Wouldn't Be Jealous". MTV. Retrieved April 27, 2012. ^ Brandee J. Tecson (March 10, 2005). "Gavin DeGraw, Michelle Branch Play For 'Hill' Fans In L.A." MTV. Retrieved April 27, 2012. ^ "Bethany Joy Lenz sings for 'One Tree Hill'". TODAY.com. Associated Press. November 14, 2005. Retrieved April 27, 2012. ^ Brandee J. Tecson (August 30, 2005). "Tyler Hilton Says Playing Arenas Is Like Being In 'Rock And Roll Prison'". MTV. Retrieved April 27, 2012. ^ a b c John J. Moser (April 20, 2012). "Tyler Hilton returns to 'One Tree Hill,' now returns to charts with new album". The Morning Call. Retrieved April 27, 2012. 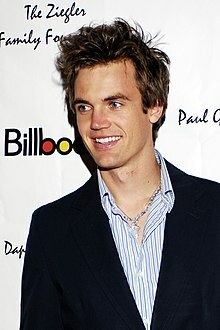 ^ "'Ladies and Gentlemen,' Tyler Hilton". ABC News. April 14, 2010. Retrieved April 27, 2012. ^ Anderson, Kyle (July 1, 2011). "Hear Tyler Hilton's 'Faithful,' from the Tom Hanks-produced 'Larry Crowne' soundtrack: An EW Exclusive!". Entertainment Weekly. EW.com. Retrieved May 3, 2012. ^ "Tyler Hilton's Forget The Storm Available Today; Hilton Currently on U.S. Spring Tour". PR Web. April 3, 2012. Retrieved April 28, 2012. ^ "Singer-Songwriter Dion Roy and One Tree Hill Star Tyler Hilton Add New Cities to their Spring Tour". PR Web. March 30, 2012. Retrieved April 28, 2012. ^ "Boyce Avenue announce Ingrid Michaelson & Tyler Hilton as special guests support". Alt Sounds. April 24, 2012. Archived from the original on April 30, 2012. Retrieved April 28, 2012. ^ "Taylor Swift, Tyler Hilton get together for video". Country Standard Time. January 16, 2007. Retrieved May 3, 2012. ^ Conaway, Alanna (November 5, 2011). "Gloriana Shoots Music Video for '(Kissed You) Good Night' Starring Tyler Hilton". Taste of Country. Retrieved May 3, 2012. ^ Carina Adly MacKenzie (July 10, 2011). "'One Tree Hill' Season 9: Tyler Hilton returns as Chris Keller". Zap2it. Archived from the original on 12 July 2011. Retrieved 3 May 2012. ^ a b c "Tyler Hilton Album & Songs Chart History". Billboard. Retrieved April 28, 2012. ^ "Tyler Hilton". Woodycone.com. 2004-07-13. Retrieved 2010-04-09. ^ 7/13/05 (2005-06-27). "How Love Should Be | Tyler Hilton | Music Video". MTV. Retrieved 2010-04-09. ^ 5/10/07 (2007-04-13). "You'll Ask for Me | Tyler Hilton | Music Video". MTV. Retrieved 2010-04-09.